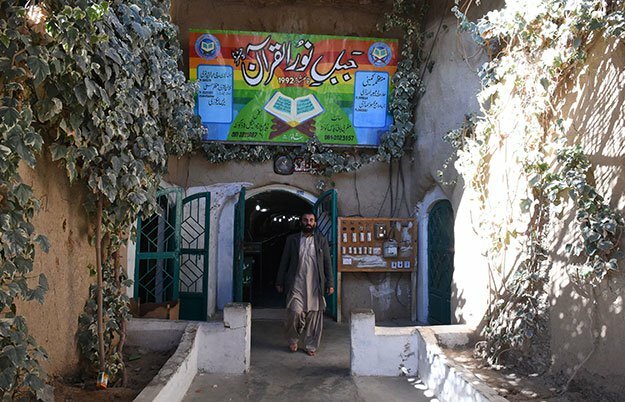 Inside the dry, biscuit-coloured mountains surrounding Quetta lies an unexpected treasure: a honeycomb of tunnels bursting with cases of Holy Qurans, hidden safe from desecration. The hill known as Jabal-e-Noor, or “Mountain of Light”, has been visited by hundreds of thousands of people since two brothers turned it into a shrine for Islam’s holy book, some copies of which are up to 600 years old, officials who run it say. “We have buried at least five million sacks of old Holy Qurans,” says Jabal-e-Noor administrator Haji Muzaffar Ali. But the mountain’s labyrinth of tunnels is steadily nearing capacity. Hundreds of sacks packed with copies of the holy book now lie exposed on the hillside as administrators struggle to create space for them. The problem is especially thorny in Pakistan, where any disrespect to the Quran can inflame accusations of blasphemy, punishable by death — whether by the state or at the hands of a vigilante mob. Islam’s holy text is believed by Muslims to be the word of God spoken through the Prophet Muhammad (pbuh) directly to mankind. For that reason the words themselves are held sacred, meaning Muslims must dispose of their old Qurans with great respect. But the man behind the mountain, affluent 77-year-old businessman Abdul Sammad Lehri, has an idea that, if realised, would prove both risky and revolutionary: building one of Pakistan’s first-ever Quran-recycling plants. The move could turn Lehri’s shrine into a target. In neighbouring Afghanistan in 2011, around 1,000 angry demonstrators partially destroyed a paper mill that had been accused of recycling the Quran into toilet paper. While in Pakistan an angry mob torched a factory in Punjab province in November 2015 after one of its employees was accused of burning pages from the Quran in the boiler. But, perhaps surprisingly, scholars in Pakistan say it could work. “The scholars… approve recycling of Qurans and if a recycling plant is reusing the pages of Qurans, there is no harm,” says Tahir Mehmood Ashrafi, chairman of the Pakistan Ulema (religious scholars) Council. So long as the words are removed, and the solution used to remove it disposed off in accordance with Islamic teachings, leading scholar Mufti Muneeb-ur-Rehman says, “then you can use those pages to reproduce or manufacture cardboards or anything”. Existing plants in Pakistan do not recycle Qurans because of the restrictions involved, Irfan Qadir, secretary of the Punjab Quran Board, which monitors the collection and disposal of pages of Quranic verse, tells AFP — such as only Muslims being allowed to take part in the work. The foundation, he says, puts water and the pages of the Quran in a barrel together, where the words are washed away. At Jabal-e-Noor, named after the mountain in Saudi Arabia where the Prophet (pbuh) is said to have received the first verses of the Quran, the idea exists only in the minds of Lehri and his team for now. Visitors to the mountain can leave donations but pay no fee to enter, and Lehri says they need the funds. “We want to install the plant and dig out more tunnels, but have no resources,” he explains. Lehri’s passion for protecting the words of the Quran began in 1956, he tells AFP during an interview at his home in Quetta, surrounded by medicines and newspapers. He spotted a newspaper with a large picture of the Holy Kaabah lying on the floor of a friend’s car, he says. Picking it up, he vowed to make it his mission to forever safeguard holy images and words. In 1992, he says, he and his brother Abdul Rashid were running a stone-crushing business on a property leased in the hills outside Quetta. But they were only using a small portion of the space leased. So, he says, “I decided to bury them (the pages) inside this mountain”. As the flow of pilgrims to Jabal-e-Noor increased, many began leaving messages scribbled on the walls of the tunnels — graffitied prayers, most seeking love, for God to grant. “Oh God, may I get a marriage of my choice,” pleads one, while others are more specific: “God, please break Amina’s engagement and rid her of Hamza”. Those who run the mountain are now also praying for a miracle. “I’ve asked some (rupee) billionaire friends to help” fund the recycling plant, Lehri tells AFP. “They initially agreed — but now they are not responding,” he says. 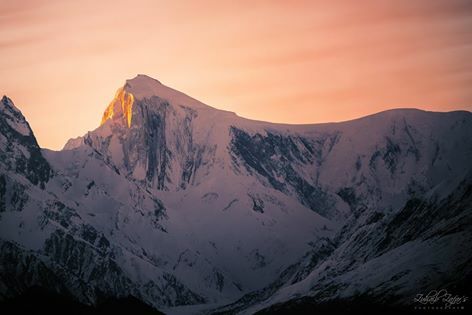 PakPeak Tirch Mir (7708 m) is the highest peak in the world outside Himalaya and Karakorum Region.The Tirich Mir is a chain of about eleven peaks with different routes to their submits. Tirich Mir main peak 7,708m is the highest peak of the Hindukush Mountain range and was first climbed in 1950 by a Norwegian expedition which was lead by Arne Naess ,the famous Norwegian philosopher, other expedition members were P. Kvern berg and H. Berg. Tirich Mir West II , 7,500m was climbed in 1974 by Beppe Re and Guido Machetto of an Italian expedition. After establishing base camp, the party set up two additional camps. In order to acclimatize itself with high altitude climbing, the party also climbed an already-climbed Dir gol Zom peak. On July 20 1967 Tirich Mir West I , 7487m was climbed through the north west col by a Czechoslovak expedition led by Engineer Vladimir Sedovy. J. Cervinka, I. Galfy, V. Smida and I. Urbanovic reached the top. The Czech expedition had not a single oxygen flask nor did they fix ropes. Tirich Mir West III 7,400m was climbed in 1974 by Groupe Universitaire de Montagne et de Ski of France and was led by Guy Lucazeau and Bernard Amy. 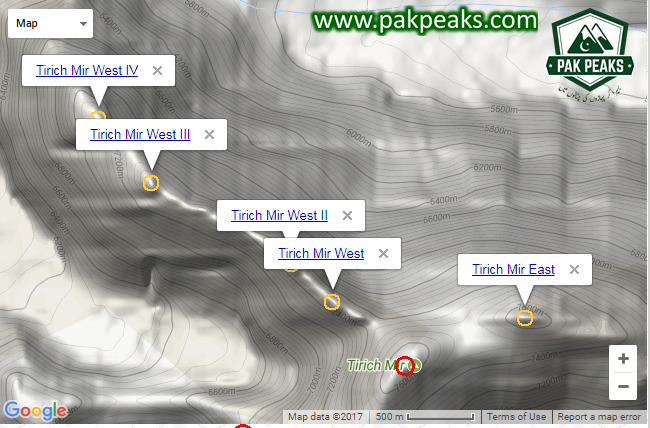 The sixth peak of the Tirich Mir range is Tirich Mir West IV – 7,338m. It was climbed in 1967 by Kurt Diemberger and Dietmar Proske through the very difficult north face. Diemberger also made the first circle around the Tirich Mirs. The purpose was to carry-out geological survey of the area. Another interesting peak in the Tirich Mir range is un-named with a height of 7,100m. This peak is situated to the south of Tirich Mir Main peak.. The northern spur of Tirich Mir at 7,056m was climbed in 1965 by Kurt Diemberger, Herwig Handler and Fritz Lindner of a German – Austrian expedition. Tirich Mir Little 6,550m was climbed in 1969 by the British-Pak Army Mountaineering expedition which was led by Maj. J. W. Fleming of the British Army. It is located in Pir Panjal Range near the city of Bagh in Azad Jammu and Kashmir, the 4,060-metre Ganga Choti offers spectacular views into Indian Held-Kashmir on the east, and can be climbed without any technical equipment. The nearest town to it is Sudhaan Gali. At 4,694 m, Rush is one of the highest alpine lakes in the world. 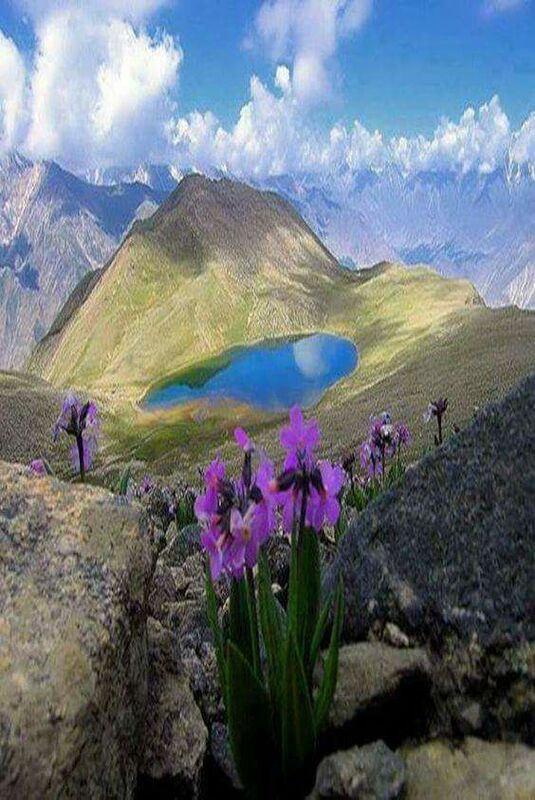 PakPeak Rush Pari commonly called as Rush Peak is located in the Gilgit District . It can be reached via Nagar Valley and Hoper Village. The peak can be accessed via Hoper Glacier (Bualtar Glacier) and Barpu Glacier. 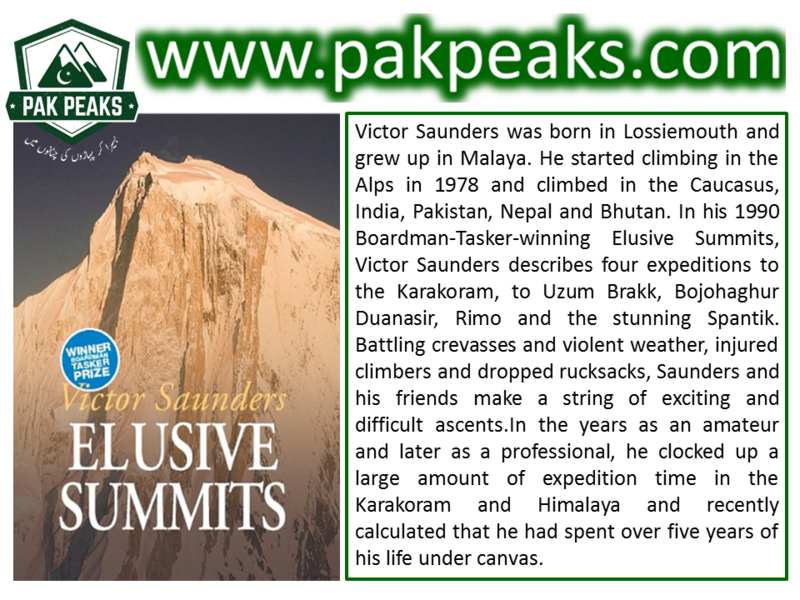 The peak is relatively easy to climb in the summer months and ascents have been made by amateur climbers without proper mountaineering gear. In winter, access to the mountain is made difficult by heavy snows. The top of the peak provides stunning views of PakPeak Miar (6,824 m) and PakPeak Phuparash (6,574 m). On a clear day, one can look east and see PakPeak K2 (8611m) and PakPeak Broad Peak(8051m) . At the mountain’s base lies one of the world’s highest alpine lakes, Rush Lake (4,694m). The trek to Rush Lake provides spectacular views of PakPeak Spantik, PakPeak Malubiting, PakPeak Miar , PakPeak Phuparash and PakPeak UltarSar.